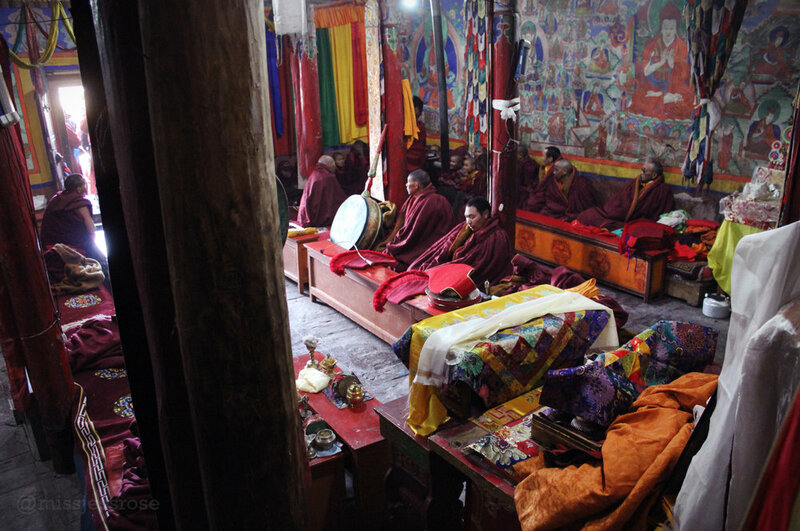 We are at Matho Monastery in Ladakh, India during the Nagrang Festival in February. 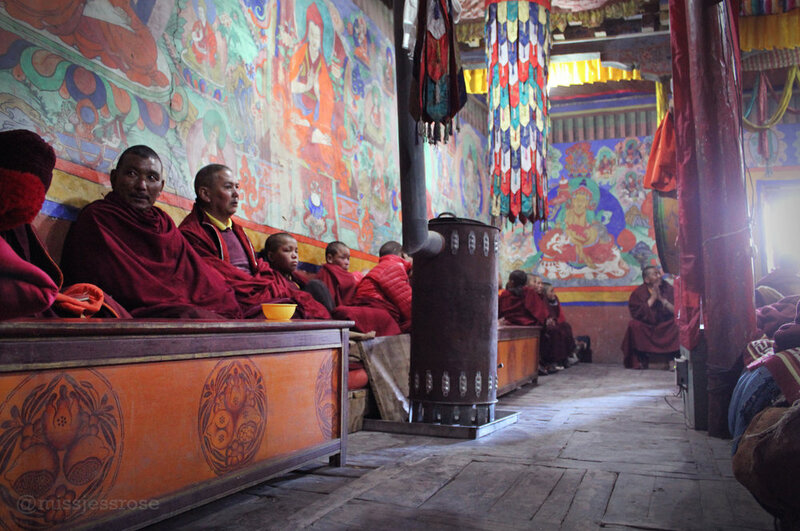 Matho is a Tibetan Buddhist monastery of the Shakyapa tradition, situated in the state of Jammu Kashmir, the northernmost region of India that borders Pakistan, Afghanistan, China, and Tibet, among other countries. It's a complete coincidence that we've arrived here on the very same day that the oracles are to emerge from their year-long trance meditation, and I'm super excited to have stumbled upon such a unique cultural ritual. The two Rongtsan oracles have been in isolation, practicing both fasting and meditation in order to prepare their bodies as receptacles to channel the spiritual powers of Dharma. On this day, their bodies are said to be possessed by ancient spirits, which is how they are able to predict the future for the villagers. The Himalaya mountains here in Ladakh are about 11,000 feet, high enough that the sun is harsh and bright, but the air is crisp and cold. I'm bundled up in a used winter coat I bought in New Delhi before our flight into Leh. The altitude has left me slightly dizzy, but the breathtaking white, snowy mountain peaks are worth it. It's been over an hour since we arrived at the monastery, and the oracles have yet to emerge. I have no idea what to expect. I try to imagine what an entire year of silent meditation must be like; meditating alone in silence for just several days would be challenge enough. 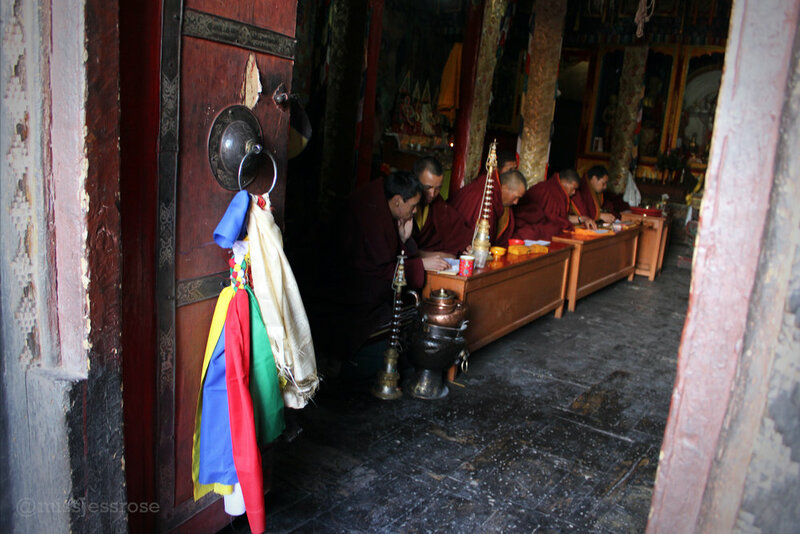 While waiting for the oracles, we squeeze through the crowds and explore the monastery. Peeking inside open meditation rooms, red-robed monks sit cross-legged on the ground, tapping on their cell phones, occasionally playing horn-like instruments and generally waiting around, just like us. 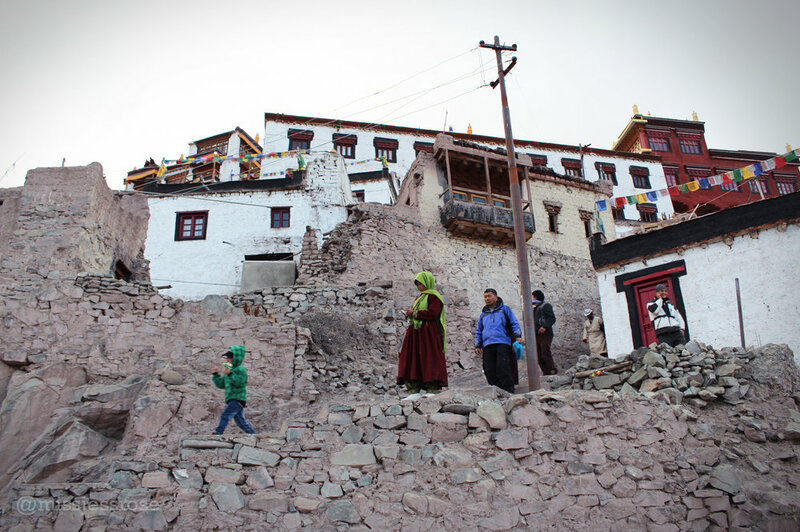 Even though it feels like we've left India behind and traveled to an entirely new and distinct Tibetan culture, that general Indian feeling of confusion and disorganization persists here too. It's crowded and chaotic, and we are clearly the only foreigners, so it feels like we stand out, if only because we have no idea what's going on. But this is not an unfamiliar feeling for me at this point. Much of my time in India has been chaos and confusion layered with wonder and delight. At last I hear horns and music from above, drifting down from the highest balcony. A procession of robed monks begins. I have no idea what to expect. How will we know which are the two oracles? What will they do once they emerge? The procession of monks continues with long horns, drums, and all sorts of special instruments. Two figures walk beneath a white cloth covering, which is carried by two different monks—one in front, one in back. The two figures hidden beneath the white cloth are the oracles! My mind is blown when the oracles finally appear from beneath the white covering. The ceremony is so foreign, so curious, that it feels like something derived culturally from Africa or New Guinea, not India or Tibet. But maybe this is my own ignorance, despite having studied art history, I don't recall ever learning about such mystical details of Tibetan culture. I want so badly to capture all of this beautiful strangeness, but photos of the sacred oracles are prohibited. We respect this ban, and dutifully take in the experience with full attention minus electronic distractions. It's a good thing too—we witness a military policeman take a photo and subsequently have his fancy SLR camera snatched away by a group of vigilant monks. The two oracles are black. Well, their skin is black. But as they process around the monastery balcony and arrive at a central stage area surrounded by crowds, I realize that they've covered their skin in some sort of black oil with charcoal. Their chests are painted with colorful shapes in white, red, green, yellow ink, figures which seem to resemble Buddha. The oracles' hair is a mass of matted dreadlocks and other black stuff that resembles a furry animal carcass woven into a giant clump on their head. The mass of furry hair material is so thick and dense, it obscures their faces. When they walk, the two future-tellers amble along hunched over, like old, thin men possessed by a spirit. Their skin is exposed to the chilly mountain air, wearing only strips of ragged cloth around their waists and shabby boots that look to be made from animal leather. They dispense blessings as they pass through the crowds. I wonder if they are cold, with their bare arms, legs and chest. Someone gives them each a clean white cloth to wrap around the jangling, dirty mess on their hips. The oracles jingle their anklets, and jump around, moving inside rooms of the monastery and then popping back out again into sight. As last, they come to center stage. From here, they each take a conch shell, dip it into a mixture of roasted barley, and toss it onto the crowd. People cheer. The oracles then speak a much anticipated, but indecipherable prophecy. The crowds cheer again. Later I'm told, even local natives can't understand the ancient language they use. We find out what they've predicted—the future looks bright. Weather will be good for the villagers, it will rain plenty, and all will be well. That's fine news. Just like that, the quirky, jumpy oracles recede back into the monastery from whence they came. The ceremony has ended, and the sun has dropped behind Himalayan peaks. We turn with the crowds to descend back into the village as the temperature quickly drops. There is so much to know in this vast world. I feel like I've just stepped out of a National Geographic documentary about obscure Tibetan cultural traditions. I think of just how many other curious traditions, rituals, and ceremonies must exist across Africa, Asia, and beyond, and how isolated we are in our safe bubble at home in the U.S. Many of us are left so unknowing. I feel like the world is a great treasure trove meant to be known, and yet it's far to large to ever get to it all. 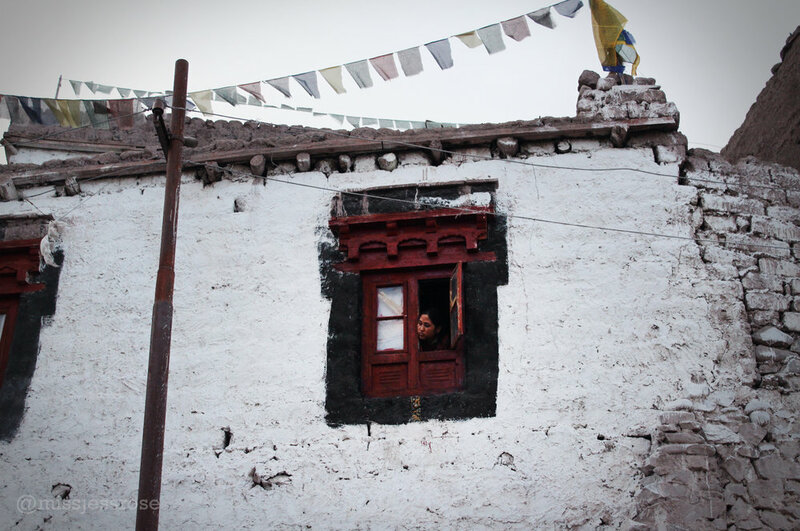 Tibetan prayer flags fly from rooftops as we walk down the dirt pathway, weaving through clusters of white stupas. Along the way, I stop for a tiny cup of hot chai tea. The sun is well beyond the last bit of mountains now. The oracles are right—indeed, all is good and well.